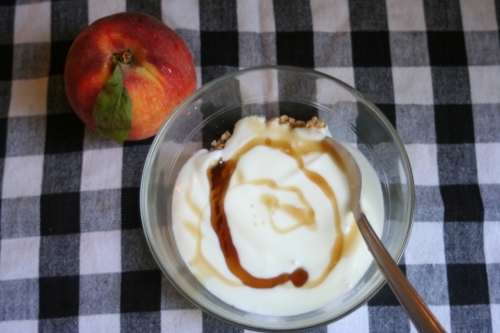 Checked cloth, fresh peach, yogurt and a maple syrup swirl. Last week, it seemed that there was a lot going on- events and nonstop action. This week, I’ve still been busy, but more in a getting-things-done kind of way. Checking things off the ever-present To-Do List and moving on to the next thing, which usually leads to a nice sense of satisfaction. This Friday Gratitude is significant perhaps, as I realize how long I’ve done this weekly series. I don’t exactly consider myself good at keeping up with things regularly, and this is Friday Gratitude #12!. I’ve been doing this gratitude thing every single week since May 31; I love that. I love that this weekly practice has caused me to think of the positives throughout the week, as well. Spinach sautéed with garlic, then tossed with quinoa, mozzarella cheese, white kidney beans, lemon juice and red pepper flakes. Wahoo, it’s time for some positivity! 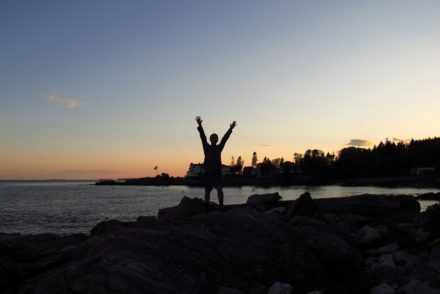 Friday Gratitude, Part 12: Productivity, sauna time, and more! I’m grateful for my productivity this week. Having a new day planner really helps me to keep track of errands to run, who I’ve been in touch with, personally and blog-wise, and deadlines (school-related, blog, etc). I’m patting myself on the back this week for wrangling in my ADD-prone mind and making that extra effort to be a bit more organized. 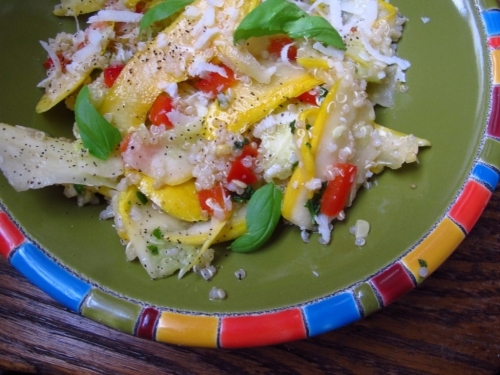 Summer squash salad: raw squash tossed with a basil, lemon juice, and olive oil marinade, plus quinoa, red bell pepper, and pecorino romano cheese. As always, I’m grateful for hang out time with friends, spending time with my favorite one-and-a-half year old Bean, and that hard-working, talented and supportive husband of mine. 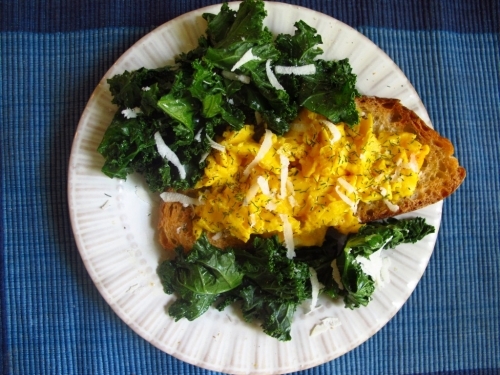 Lightly sautéed kale with salt and lemon juice and scrambled eggs on toast, all sprinkled with pecorino romano cheese and some dill. I’m guest posting on another blog next month and Meg has done feature posts on everyone who’s filling in for her- here’s the sweet write-up she did on me and Sweet and Savoring! Summer market waffles: Putting zucchini and basil in waffle batter turned out to be a very good idea! Do any of you have gardens? We have lots of herbs as well as veggies, and this post on how to harvest sage is particularly helpful. 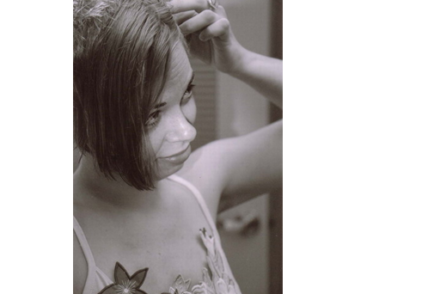 I’m not a mother, but I love what Bridget says here about summer, motherhood, and beauty. Sweet gratitude list, Pippi! Checking things off the list and organizing always make life much easier. How great that it’s your 12th Friday Gratitude—the perfect, well-established ritual that’s a joy to write and read. For a while, Andrea and I emailed each other daily gratitude lists. It’s a lovely way to appreciate what’s around us and keep in touch. Thanks, Beck! Funnily enough, I thought it was my lamest gratitude post yet, but the point is, I’m doing it consistently 🙂 That’s awesome that you and Andrew would do it daily! I loved your comment that doing the Friday gratitude series leads to positive feelings throughout the week. That makes so much sense. Awesome. Haha, glad my pictures had some effect, Lisa! And yes, that was a nice gratitude realization- who would’ve thought this little practice & series would have such an effect? 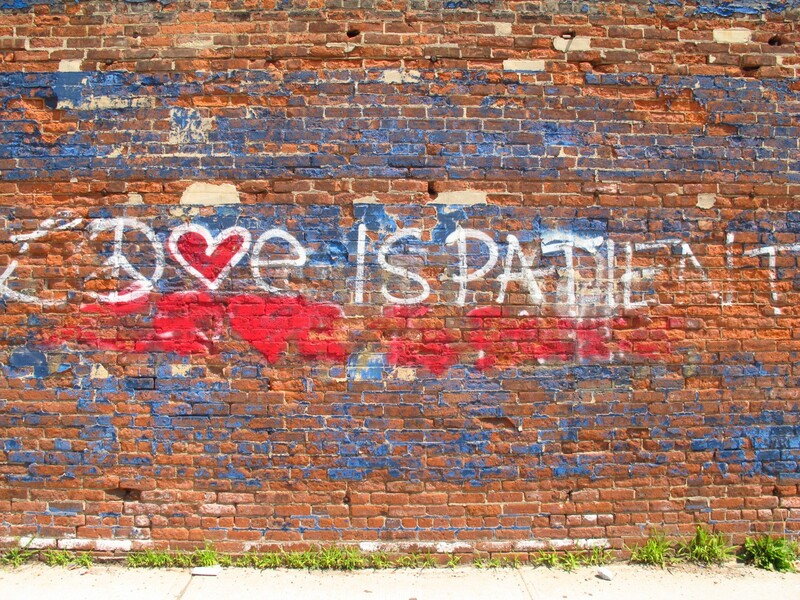 I love, love, love the photo/painting quote. It does help me remember – so does writing. My two favorite things. Appreciate this, Tamara. I spent a bit of time searching for just the right quote to go with this post- glad it resonated with you, too! I had a productive week too, so I am SO thankful for that. Getting stuff done can feel so good! I’ve been writing my own gratitude list on my phone just for myself because I love how you always write on! It’s so positive! Yum. This all looks so good. I have loads of summer squash, so will be trying the raw summer squash salad. 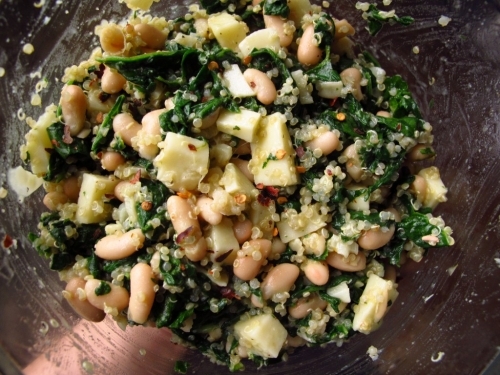 The salad with spinach, quinoa, and white beans looks delicious, too! Do you use recipes or just create as you go? And I’m so happy that you feel productive this week! It is a great feeling, isn’t it? Yay for Friday Gratitude! The spinach salad is super easy to make, I linked to the original in the comment above yours. It’s soooooo good, I promise! And thanks! Yay for Friday Gratitude, indeed. I love the gratitude post. I use to keep a gratitude journal in a book, then in an app and somehow I just stopped. I need to get back to this daily. Love the photo organization…I need to get mine done. Now that’s a huge project. Isn’t organizing photos SUCH a huge task? Oh my goodness, but it feels good when it’s all done. All organized, now on to uploading! I am grateful for all the wonderful people I have met through blogging. And yes your pictures are making me hungry! The spinach quinoa dish looks incredible! Productive days and weeks always make me feel better.